Booja Booja are the only organic, dairy-free, mostly raw company, which is UK-based. They boast a product line of gluten and soya free chocolates, which are guilt-free and delicious. I was recently given the gift of Booja Booja Champagne Truffles, which are made using organic champagne, and the mostly-raw recipe, which sets them apart from any other truffles on the market. They're a serious contender for even truffle-fiends out there. They don't taste raw, if you get my meaning; the truffles are rich little bites, which are the perfect gift for any chocolate-lover. I hadn't expected a gift from the colleagues when I left work, but they surprised me with this thoughtful box (125g), of raw chocolates. You can easily buy, or even make your own truffles, but to buy raw, organic chocolates, which taste as good as they look is a rarity, but Booja Booja have done it justice. "Being Dairy Free makes our products accessible to many people who can't usually enjoy the delights of chocolate truffles and ice cream. We're committed to ensuring that people who need to avoid dairy and casein, due to allergies or intolerances, can enjoy Booja-Booja in confidence. They invite curious customers to get in touch, just in case you're unsure about certain ingredients, or would like to know more about the company/who they work with. 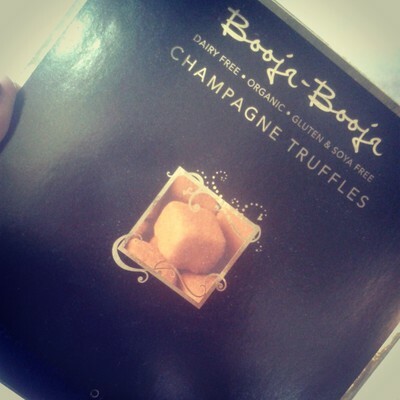 Back to the point: Booja Booja's Champagne Truffles are exquisite, and receiving them as a leaving gift was one of the loveliest (and tastiest) things I have ever had the pleasure of receiving. If you'd like to do the same as my former colleagues and give the gift of dairy-free chocolate, find Booja Booja at any of their outlets across the UK.